The research project is the first of its kind in the world, following previous research which saw orangutans interacting with tablets and touchscreen computers. However, the hardware had physical and logistical constraints which limited how the orangutans could operate the devices. The project takes place at Melbourne Zoo this month. The orangutans will be able to engage with the Xbox Kinect’s projected screen much like a touch screen, with no physical devices required to be present in their enclosure. 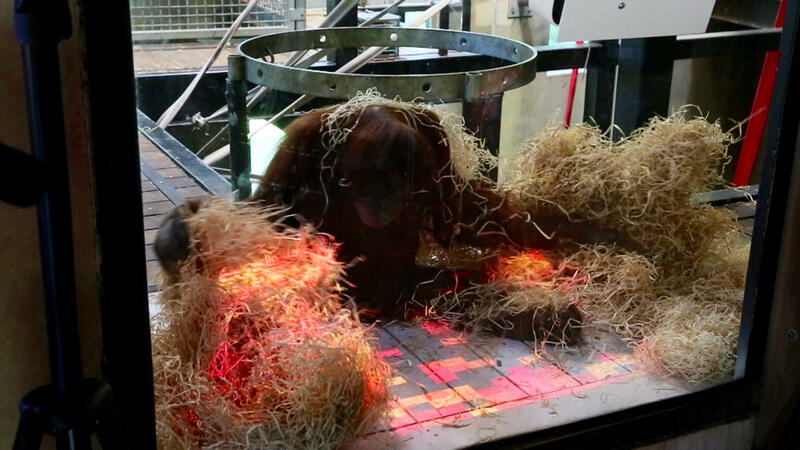 Initial test results with the Melbourne Zoo’s twelve-year-old orangutan Malu have been positive. He reacted to the projection of a red dot on the floor by immediately moving closer to it and kissing it; after it exploded and reappeared, he kissed it again. The project aim is to “provide a new form of stimulation for the apes, giving them the ability to initiate their own fun while stimulating their problem solving.” Melbourne Zoo currently uses a variety of digital and non-digital activities to encourage “positive and natural behaviours” of the orangutans, simulating foraging, browsing, exploration, and play. Researchers are also developing video games, painting applications, and galleries specifically designed for orangutans. The projection interface means that the animals can use their entire bodies to activate the space as well. It is hoped that the research will eventually lead to ways for orangutans to interact with zoo visitors via digital games. The project will run all of February. Tagged Being, Kinect, Orangutans, Preview, Used, Xbox.